Immediately after registration we get to the page with the image of our city. It was here at the beginning of the main events will unfold. 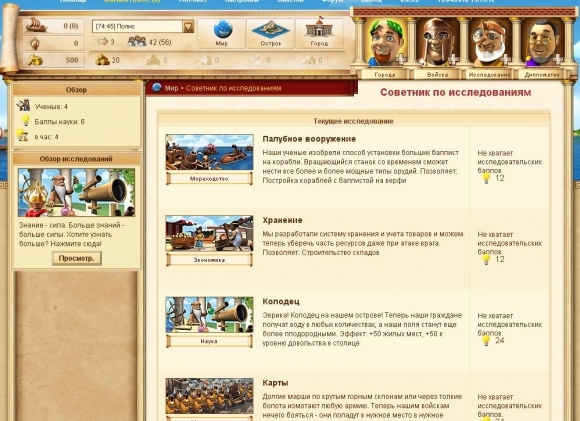 Those of you who played the iconic computer game "Civilization" will see the similarity with Ikariam. From the very beginning of the game we have a small amount of gold and wood. With these resources we can build some buildings. To build the just click on one of the vacant lots and selections that are going to build, first of only two - the Academy and Barracks. When building or buying something, as in any other strategy, resources are spent. It is worth considering, where are the resources to produce. 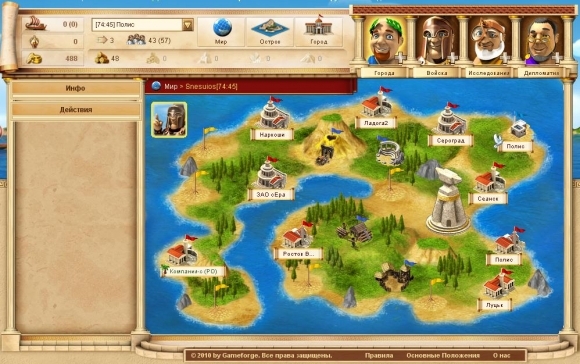 Click on the icon of the island and see that our island can produce sulfur and wood. You must be careful to consumption of resources, especially those who can not get to "his" island. Now consider the basic principles of the game. The prosperity of the city means that the number of inhabitants is growing and they are happy. The more people, the more workers will be able to obtain for us the resources, and scientists can make all the new discoveries that will contribute to even greater prosperity of the city. To protect the city in the barracks you can, or rather the need to recruit troops. 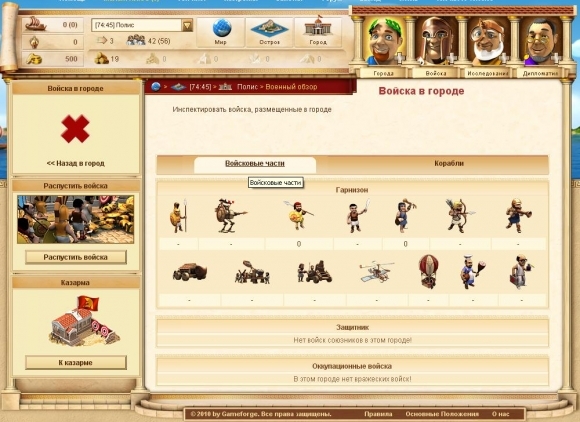 In total there are 14 types of troops. When the welfare of the city will improve, we need to attack. The first sign of impending danger, the message is adviser on military affairs. Unfortunately, the process is the battle we will not see, and we get only a message from the same counselor if our city is captured or the attack was repulsed. 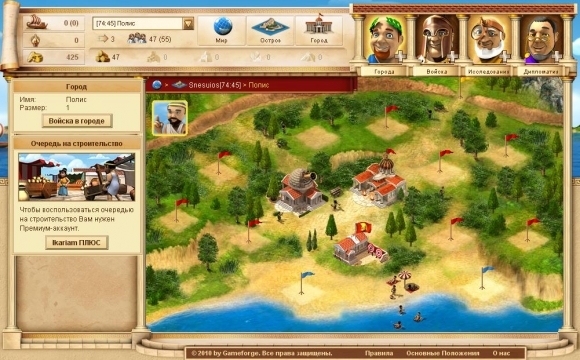 We have described only the beginning of the game, more and more interesting and fun to play. The next step will be the availability of sea battles, trade with other cities, drift spies in enemy cities with a subsequent attack, and much more. Conclusion: The online game is built on the type of civilization can not be uninteresting, but the game still has a few drawbacks. For example it is impossible in any way participate in the battles, as well as a "Ping" the game, when for a long time nothing can happen. While on the other hand, for some it may be a plus, who likes to play and at the same time to do other things. In any case, try to play is.